A reflection for the 5th Sunday, Ordinary Time, Year A. The readings are Isaiah 58:7-10, Psalm 112, 1 Cor 2:1-5 and Matthew 5:13-16. Are you a saint? I’ve asked this question many times to many a group. “Who is a saint?” You may get two or three hands at the most. It’s a bit of an unfair question because we have the SAINTS – those are the canonized, the ones the Church gives us as examples and intercessors. But if you look at the most basic definition of a saint, someone who is in Heaven, then we should all be hoping to be saints. Don’t you plan on going to Heaven? My friend Steve Angrisano always says that the other option is not a very good option: Stick to Plan A. If you plan to go to Heaven, then you plan on being a Saint. Simple! But how do we get to Heaven? By doing good works? By praying lots of Rosaries? By going to Mass? Sadly, all those answers are wrong. We get to Heaven because God is good. We get to Heaven because of God’s love and mercy. No one deserves or is worthy of Heaven. But we can get there because God is good and merciful. So why be good, do good things, go to Mass and pray if that’s not helping us get to Heaven? We do good things because God has been good to us. We love because God has loved us first. Our doing good works is a response to the love of God. We love God back, we want to be with Him and so we can’t but help to do what he has asked us to do, as he has told us in today’s first reading: share your bread with the hungry, shelter the oppressed and the homeless (the refugee); clothe the naked, don’t turn your back on your own. Let your light shine. We do that because God has asked us to do it and we want to respond to His love with love. We pray because that is how we relate to the One we love. We use Scripture because that is how we learn about the One we love and listen to the One we love. We receive the Sacraments because that is how we let the One we love visibly act in our lives through His Grace. We belong to a Parish community because that’s how we help each other in living this relationship with the One we love. We do charitable works because that is how we show the One we love that we love him. Most of us are not going to start a new amazing religious congregation, or are going to be Pope. Most of us are not going to bring about peace in the Middle East or be the next Mother Teresa. Most of us are not going to be martyrs for our Faith. But all of us will have daily opportunities to practice holiness. All of us have daily opportunities to practice saintliness. Maybe the most holy thing you’re going to do is choose to speak to that person that everyone is making fun of, or tell your buddies that it’s not cool to talk about women that way. Maybe the most holy thing you’ll ever do is spend time visiting someone who is lonely or a friend who’s in hospital. St. Mother Teresa always said that we are not called to do great things, but small things with great love. That’s what I like about this image of being salt. Salt is everywhere and it’s cheap. We use it as a preservative and to melt the ice on the roads. We also use it to add flavour. But you don’t need a lot of salt to add flavour. You add a dash of salt if you’re baking bread. You even sometimes add a little bit of salt if you’re making a dessert. In order to add the flavour, to make a difference, the salt has to mix with the other ingredients and it has to stop being salt. And all you need is a little salt. Just a bit. Jesus didn’t say that we are the whole loaf of bread. He said that we are the salt. It’s the same with light. All you need is a small candle in order to dispel the darkness. It just takes a bit of light to scatter the darkness. That’s what St. Paul says about how he approached the Corinthians. He didn’t go at them like a blinding light, hitting them over the head. But, gently, like salt. 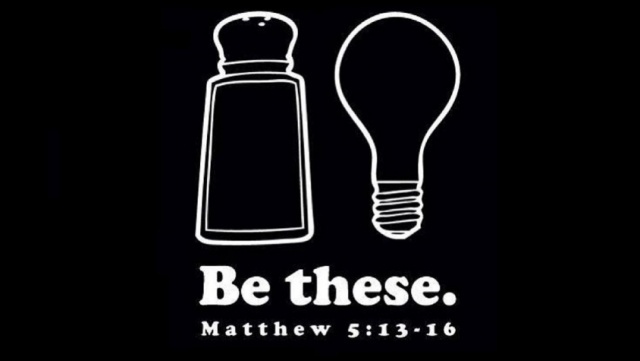 But we can’t be salt and light unless we go out there and do. Unless we mix with the other ingredients. “I like to describe it as the paralysis that comes from confusing happiness with a sofa. In other words, to think that in order to be happy all we need is a good sofa. A sofa that makes us feel comfortable, calm, safe. A sofa like one of those we have nowadays with a built-in massage unit to put us to sleep. A sofa that promises us hours of comfort so we can escape to the world of videogames and spend all kinds of time in front of a computer screen. A sofa that keeps us safe from any kind of pain and fear. A sofa that allows us to stay home without needing to work at, or worry about, anything. “Sofa-happiness”! That is probably the most harmful and insidious form of paralysis, since little by little, without even realizing it, we start to nod off, to grow drowsy and dull while others – perhaps more alert than we are, but not necessarily better – decide our future for us. For many people in fact, it is much easier and better to have drowsy and dull kids who confuse happiness with a sofa. For many people, that is more convenient than having young people who are alert and searching, trying to respond to God’s dream and to all the restlessness present in the human heart. Being salt and light, means leaving mark, making a difference. And notice that it’s not a choice. Jesus doesn’t say ‘you could be salt if you feel like it, if you are born in this or that country, if you are privileged, if you speak English, if you were educated you could be salt; you could be light if you wanted, if the planets align or if it’s the year of the rooster.’ No. He says, ‘you ARE the salt of the earth. You ARE the light of the world. It’s not an option. It’s who we are. The only option is to say yes to that which we are created to be. Leave a mark, make a difference. Not beating people over the head, but gently. Why? Because Jesus, who loved us first and who continues to love us, who loves us into existence, asked us to. Because we love him back. Are you going to be a saint when you die? Let’s get on with it, with boots laced. Go and let your light shine! « Do you Believe This?